Good lighting is one of the most important investments you can make for your 4WD. Without it, it could be extremely challenging, not to mention dangerous, to drive at night. Fortunately, Cosmoblaze LED light bars are designed to provide users with maximum reliability and versatility. These lighting devices are extremely powerful and durable, which are a huge help when navigating tough terrain in low light conditions and unpredictable weather. 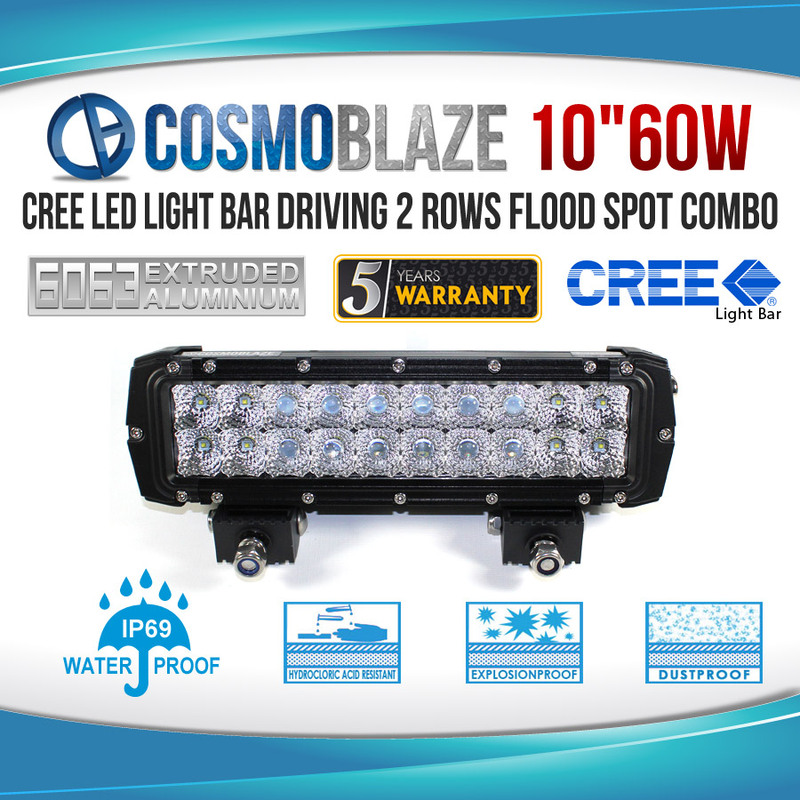 CBDR60 - Cosmoblaze 10" 60W CREE LED Light Bar is one of Cosmoblaze's product offerings guaranteed to bring your driving experience to the next level. About 10 inches in length, this premium LED light bar makes an excellent addition to your car's lighting paraphernalia. It also functions as a reliable work light that can be used in a wide range of applications, including in boats and emergency vehicles, as well as in mining, farming, and construction equipment. 1. Excellent light output. With the CBDR60, light output is unparalleled. It is equipped with 20 pieces of 3W LED light bulbs made by CREE, a company that is widely known to be a global leader in LED technology. This premium CREE LED light bar has a maximum light output of 6,600lm that is quite impressive for its size. 2. Solid housing. Every light bar made by Cosmoblaze is designed with extremely tough and durable housing to ensure optimum protection for the LED light bulbs inside. The CBDR60 is no different. It has a 6063 extruded aluminium housing that can withstand abuse and can last a very long time. It also has polycarbonate lens that is resistant against scratches and abrasion. Even if you drop this light bar from a high place, you can be sure that it will remain intact and fully functional. 3. Weatherproof. The CBDR60 is a well-protected against the elements, making this driving work light highly suitable for Australian driving conditions. It has an IP69 waterproof and dustproof rating and sealed nickel-plated cable connectors that guard against water intrusion. 4. Flood and spot combo. With this light bar, you don't have to purchase a separate spot light or flood light for your 4WD. It features a combination of flood and spot style of illumination. Its spot light can reach distances of up to 820 metres while its flood light can reach 580 metres with no lux loss. 5. Better heat elimination. Overheating is not a problem with the CBDR60. It features a dual oversized heat sink and military breathers, ensuring that the heat generated by the LED light bulbs will be dispersed easily. With its key qualities and capabilities, the CBDR60 ( Cosmoblaze 10" 60W CREE LED Light Bar) makes an excellent lighting device for 4WD enthusiasts and competition regulars. So if you're looking for a great flood spot combo light bar that is both powerful and durable, you can't go wrong with the CBDR60. Visit Elinz Electronics to purchase this product.